Without a standard and secure environment for social media, your organization remains vulnerable to malware, unauthorized or fraudulent accounts, and data leakage. IT departments are usually the ones who get called in to clean up the mess. Why not take control of the situation now? 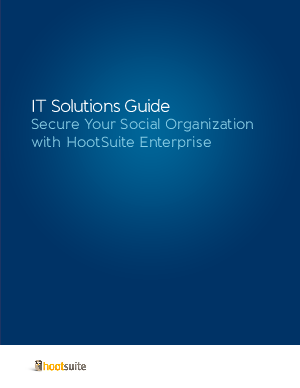 Download this guide to HootSuite Enterprise for IT departments today.